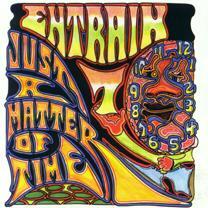 George Graham Reviews Entrain's "Just a Matter of Time"
There's something about northern climes that seems to cultivate jam bands. Phish, Moe and Strangefolk all hail from New England or Upstate New York. The String Cheese Incident are from snowy Colorado. And this week, we have another outstanding jam band from New England, the long-running group Entrain from Martha's Vineyard, Massachusetts, who have just released their seventh album called Just a Matter of Time. It also seems that the best jams bands have particularly strong drummers, and Entrain was founded in the early 1990s by drummer, percussionist and composer Tom Major, a graduate of the Berklee College of Music in Boston, who had found employment playing in the band of rock legend Bo Diddley, and was living in New York. He set out to start a group that emphasized the infectious drum lines that Diddley's group would sometimes get into. At about the same time, Major took a three-week trip to Gambia in West Africa to absorb the music and culture there. He came back with the rhythmic essence of what has been basically a part-time group. He recruited two additional percussionists who had been members of a popular area band called the Ululators, and gradually filled out the lineup with guitar, bass keyboards and a lead vocalist. The personnel has been somewhat fluid over the years, and this latest CD has some changes since their last release, a live album about two years ago. This is also the Entrain's first studio album since 2000. But despite the changes and the hiatus, the new CD continues the great rhythmic grooves and upbeat music that has been their calling card, from the beginning. In fact, the tongue-in-cheek psychedelic style artwork on the CD booklet describes what they do as a "funky world jam ska reggae rock stew with enough drums to sink a battleship." That may be hyperbole, but it's not too far off the truth. Also serving as a theme on the album are some 21st Century flower-power hippie lyrics about peace, love and understanding, with an obvious reference to the Iraq war. Otherwise, the songs can be about dancing or some positive self-affirmation. And though the thoughts are admirable, this is not really a lyric-oriented band. Entrain is all about getting up and moving to the music. As before, there is a cross-section of styles represented -- most of them referred to in that slogan on the CD cover -- a fair amount of reggae influence, along with a good helping of New Orleans-style rhythms, plus a little zydeco, and plenty of funk-based grooves. There are even two tracks of drum solos. The CD has somewhat variable personnel, but the current lineup includes another of the founding members with Major, Sam Holmstock, who plays trombone as well as percussion. Jeff Clarks plays guitar and usually serves as lead vocalist, Lenny Bradford is heard on bass and other instruments, Philip Young is featured on sax and backing vocals, and Johnny Trama is heard mainly on guitar. Various guests are included on the CD, though not really as cameo appearances, since they usually replace one of the regular members. I think Entrain is one of the best relatively unknown jam bands out there, partly because they don't get out to play that much, being more or less a part time band. And it has been some years since their last release. But their new studio album, with its more succinct arrangements and fairly wide-ranging influences is a gem that was worth the wait. It's music that reflects the original concept of jam bands back in the 1960s when musical improvisation went hand-in-hand with a free spirit and lyrics that reflected the causes of the day. In this case, we have a similar set of circumstances, a desire for peace in the midst of an unpopular war. But the band is also about having a musical party, drawing as they do on dance rhythms from reggae to zydeco. Our grade for sound quality is close to an A. There is good clarity and a lack of needless studio effects. The aim was to present a sound emulating a live concert experience, and that comes across. Group founder Tom Major said that the name Entrain came from a phenomenon discovered in the 17th Century by Dutch scientist Christian Huygens called "entrainment" in which rhythmic events in close proximity such as pendulum clocks tend spontaneously toward moving in sync. That well describes the effect that the music's beat should have on people within earshot. It's hard to keep from moving when this CD is on.